Books begin as dreams, floating just out-of-reach in the enigmatic space between waking and sleeping where ideas and shapes of imaginary characters and terrifying plots and macabre climaxes bump against each other until someone … or something … opens the door to the mind and lets them fall as drops of inky nonsense on blank screens or flattened, bleached out tree pulp. Doesn’t matter if a writer has 50 books or 50 sentences tucked in his or her quiver of expertise. All writers start here, in the dream space. Some take off and run like Louis Zamperini with their work until they not only conquer but lap opponent writers. Others are stuck in the repetitive scene in which their legs can’t move and they’re being chased by a faceless enemy–most likely a maniac resembling whomever in their lives told them they could/would/should never be a real writer. Whichever camp you fall in–confident word slayer or trembling pantywaist–NaNoWriMo is for YOU. I’ve used it anonymously for a nonfiction manuscript that made it nowhere back in 2006. I used it in 2011 for a novel which I never completed, but which several pieces have since emerged in subsequent (and one soon-to-be-published) novels. And this year, I’m using NaNoWriMo again to finish my third novel which is 100% outlined, 20% done, and needs a kick-in-the-pants incentive for me to finish the last 50,000 words. For me, the best part about NaNoWriMo 2014 (besides the fact that it’s FREE!!!) is that two of my three teenagers are participating, too! They even have a special arm of the event for young writers which is fantastic, called the NaNoWriMo Young Writers Program. I’ve heard some teachers even use it at schools. So that’s what NaNoWriMo is–a proverbial fire under the butts of everyone and anyone who’s even remotely had even the slightest feeling that writing a book is for them. Fiction or nonfiction, zombie or Amish, horror or romance, dystopian or Southern, the genre and the subject doesn’t matter. No one’s judging you or your writing. The only thing that matters is that you get 50,000 words of it on paper/computer. Jump over the hurdles of doubt or procrastination or whatever’s holding you back and write. Here’s some more information from the NaNoWriMo press release, below. And you can always peruse the website for instructions on how to get started. It’s super easy and super fun. Use as many or as few of the tools offered on the website as is convenient for you. creative­writing communities around the world. 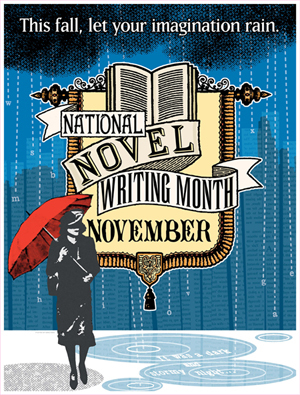 NaNoWriMo challenges people to write 50,000 words of a novel in the 30 days of November. Schuster children’s book designer Elizabeth Doyle. voices yet to be heard from all corners of the world,” says Executive Director Grant Faulkner. This year, six published authors will be writing pep talk letters to mentor these storytellers. in writing diverse representation into their novels. unique validation of professionally designed book covers for their novels­in­progress. basic skills. NaNoWriMo’s Young Writers Program focuses on developing this self­efficacyin the classroom, while also teaching writing fluency, effective goal­setting, and project management. “NaNoWriMo is a chance for my students to experience a sustained and focused project. turning their local coffee shops, bookstores, and living rooms into writing havens. neighborhood spaces, providing free resources to help build their local creative communities. NaNoWriMo, we empower and encourage vibrant creativity around the world.